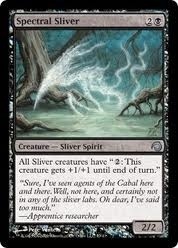 That Spectral Sliver does look very appropriate for them. Maybe when the military came, they’d already struck other towns successfully, so the monsters were told to retreat by whatever was beyond the crazy storm? Now I’m going to have Sliver images stuck in my head when I think of the snow monsters. That’s one of my favorite Magic decks btw. I actually think T&K might end up together. If nothing else, Kate needs to ditch that fiance now that she’s seen real danger in life; life’s too short to stay with someone you don’t really love. I have to say I disagree with the characters; I got very attached to Kate and Shawna in particular, which made Shawna’s death really devastating. Todd was mildly annoying and hard to connect with, but I respected his love for his son and that as his driving motivation. Kate’s fiance stuff was a little more interesting. Shawna was my favorite character, I was pretty miffed that she didn’t survive. Fred and Nan both seemed to me like they were set up to be fodder for the monsters from the get go – there was almost no introduction for them, and hardly any scenes from their POV. But they were certainly the nicest of the group. I didn’t really get attached to any of the characters either, but I was thrown off when Kate went her way and Todd’s ex showed up. But I didn’t connect with them enough to care one way or the other. All the characters read a bit like stock characters to me. The ending actually gave me hope for my own book. In the end the characters didn’t actually accomplish anything, they just survived and the cavalry saved the day. The enemy wasn’t defeated. There wasn’t much for closure. Maybe survival is an accomplishment enough. Maybe. I hope. The ending actually gave me hope for my own novel. In the end the characters didn’t really accomplish anything other than survive. They just waited for the Calvary to arrive. They didn’t defeat the monster or save the day. Maybe survival is accomplishment enough. Maybe. I hope.